Apple TV Jailbreak Demoed on Video Using SHAtter !! 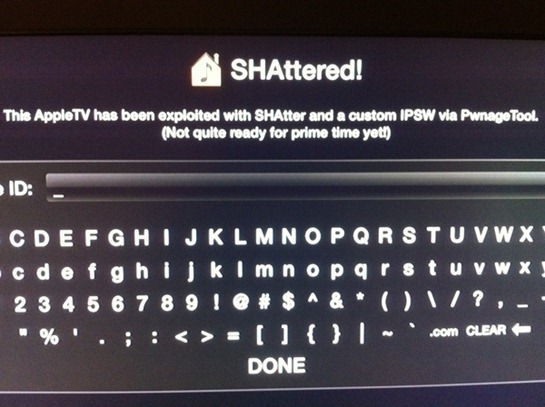 After showing off the demo of SHAtter exploit in action on an iPod touch 4G, the iPhone Dev-Team has now managed to jailbreak the newly released 2nd-gen Apple TV, running iOS 4.1 using SHAtter exploit loaded on PwnageTool. For those of you who don’t know, SHAtter is a low-level bootrom exploit which Apple will not be able to patch with a new firmware. Instead, they will have to introduce a revised hardware for all the current iOS devices to close the loophole. What this means is that once this jailbreak is out, all current iOS based devices will be pwned for life! There is currently no ETA for this new jailbreak tool. It will be released once it is ready. We will of course let you know as soon as it is available for public consumption. Stay tuned for that!